It’s been a year since this blog was reborn – I cannot write further unless I thank the people who believed in me & with a word of encouragement, a gentle nudge & a loving (?) kick got me to revive this blog – I haven’t looked back ever since and I hope to carry on with as much passion & enthusiasm as I have done the whole year through in recording the recipes that I try out in my kitchen. So thanks to my friend May, cousin Prema & hubby Roshan who in various ways (in the order mentioned above) coaxed me to continue writing this blog. My biggest support has been my hubby to whom I dedicate this post. Neurio??? You may ask, well, yes, although he is my biggest critic and the one who gives me a thumbs up or thumbs down signal each time something is whipped up in my kitchen, he was travelling when I made the Neurio and didn’t get even a crumb to eat when he returned. So yes, this is for you Roshan – feast your eyes on these pics, willya! 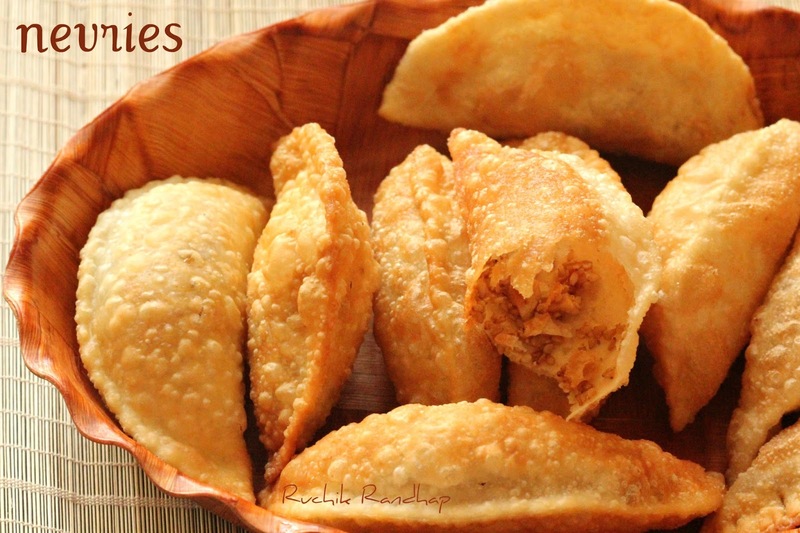 I am sure most of you have eaten the Neurio which are are popularly called as Karanji with slight variations in the filling. Karanjis are made especially during Diwali, at least in South India and are a significant item on the Kuswar platter as well during Christmas. In my opinion Neurios are best made at home as the filling is fresh, fragrant & juicy – unlike the store bought variety which is made weeks in advance and tastes rancid (stale) if you have been unlucky enough to pick up old stock. Making Neurio (Nevries) at home is lots of fun. Among all the Kuswar items I learnt to make them first from my MIL a few years ago. It is one sweet that falls into the dual category – simple yet complex – simple because technically it’s not as difficult as it looks – the dough & the filling is damn easy to make and complex only in terms of the steps involved in doling out each Nevri. Make the dough, prepare the mixture for the filling, roll out puris, place the filling, fold, cut the edges, deep fry! So yes, an extra pair of hands can be a blessing. But people like me who live away from home and have no help beyond a pair of 3 year old hands which generously help by eating up half the mixture can also make it with great elan! Describing a Nevri is what I like to do best – a crescent shaped sweet samosa with a crunchy exterior and a delightful centre – a filling made of sesame, cashewnuts, poppy seeds, kopra , raisins, sugar (or jaggery) & cardamom – is like a coming together of a large family made up of a variety of members, their characters, temperaments, shapes, sizes & nuances – each bringing in a special flavour & fragrance into the family – the presence of all brings great sweetness into one’s life and an absence of even one is greatly felt. 1. In a large wide bowl mix the maida, rawa and the salt and sprinkle about 1/2 cup of the warm water working your way towards kneading the mixture. Initially the mixture will look like bread crumbs. Use the heel of your palm to knead into a smooth dough. This can take 5-7 minutes, add parts of the reserved water until your dough is smooth & pliable. Reserve any remaining water aside. 2. Cover the dough with a damp cloth for a few minutes until required. 1. Heat a tawa/skillet and roast the sesame seeds, broken cashewnuts, grated coconut & poppy seeds one by one on a slow flame until just about roasted. Do not over roast them as they will turn bitter. 1. Make small lime size balls out of the dough, dust with a little flour and roll them into thin flat circles, the size of puris. 2. Place about 1 tsp of the sticky mixture right in the centre of the puri, place a couple of slivers of kopra and raisins each on the mixture. 3. Use the reserved water to moisten the edges of the puri – this helps to seal the edges as the water acts as a glue between the edges. Fold the puri in half such that it forms a crescent shape (semi circle). Seal the edges carefully and use a cookie cutting blade/pizza cutter to trim the jagged edges or just use a fork to make a pretty design around the edges. 1. Heat oil on a medium high flame for deep frying in a large heavy bottomed wide kadhai or wok. Test the preparedness of the oil by dropping a small ball of dough into the oil. If it comes up to the surface immediately (within 2-3 seconds) the oil is ready for deep frying. 2. Depending on how large your kadhai is carefully drop 6-7 nevris into the hot oil and fry both the sides till golden in colour. 4. Let the nevris cool completely before you store it in airtight containers. Nevris keep well for 10-12 days after which the filling may turn rancid. another keeper.. those karanjis look amazing! Wow!!! Neurio ekdum ruchik distaat. The step wise details along with the pictures are phenomenal. Mostu deo borenkaru! I'll try them. Wish i could have some rite now, one of my fav,its been a long i prepared them..
Nicely explained Shireen. Thanks to u we have an easy step step explanation. I will prepare it surely next year. Wah..Shireen, it looks so yummy.Very neatly explained.Oh my god! You have so much patience. I need to learn from you. Loved the pictures as well:-) good job girl! Oh my Gosh, These look heavenly in every way!!!!! Lucky Roshan… shireen you truly r gifted girl and go girl aim for the moon as you will do it….on the way donot forget us.. tarla Dalal baby you r left way way behind…. wow…. these look yummy… hope u recd my mail!!! looking forward to a response from you!!! we have something very similar to your karanjis.. im always fascinated how food around the globe are so diverse yet very similar in so many ways. these karanjis look so crunchy and flaky im sure i could finish a basket full of it haha. I just love them….everytime I go home thats what I ask mom to make…. What's the receipe to a crispy crust Shireen? I tried but mine turned out soggy. Yummmmm……my favorite kuswar! Such nice recipes and such beautiful pictures! Your blog is simply superb. have tried many recipes, all turned out great. Thanks and appreciate all your efforts. Hi Sara!! Thanks so much for the feedback!! So glad you liked the neurio!! Merry Christmas in advance!! Can you substitute some other type of flour for all purpose flour and still have it stay together during frying? I developed an allergy to wheat as I got older, but miss cripsy Nevries so bad. I tried rice flour, but that doesn't do well and falls apart on me. @ Anonymous: I am sorry, but I've never tried making nevries with any other flour than all purpose flour. The little chapathis (puris)/covering needs a glutinous flour to enable the filling to remain inside, hence rice flour won't work. If I ever try it with any other flour I will let u know how it turns out! Tried making the nevries on Saturday. The taste was excellent but the nevries turned out to be hard, thick and rubbery. Can you help me – as to why it turned out like this? Was it because I did not roll the dough thin enough? I prepared the nevries on Saturday. The taste was perfect but the nevries turned out thick and rubbery in taste. Can you please explain to me – where I need to correct myself. Did you roll the pooris/covering for neuries too thick? Also, if the oil was not at the right temperature it would have not fried crisp and hence making it rubbery upon cooling. Make sure that the oil is hot (but not smoking) before dropping the neuries into the pan and secondly they should be drained well of excess oil before removing from the pan..place them, on a kitchen tissue to absorb excess oil. Hope it helps! You have a very nice blog here very helpful. I am planning on making the nevris and was wanting to know the coconut used in the filling is it fresh or desicated coconut please reply. Hi Shireen, the nevreo receipe is very nice. In the end you mentioned to use the remaining dough. It is an error. You said you can make some simple salty thudki. It is not thudki, but it is thukdi. I do it often. Shireen nevreo looking very tempting. In the end you said use the remaining atta to make salty thudki. It is thukdi. I make them often. Sweet and some time salty. @ Benny Dsouza: thanks so much for bringing this to my notice…it was a typo error which has been corrected now! For how many days can this kept as we are using fresh coconut.